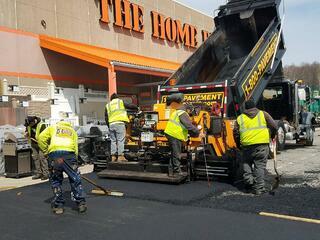 As the clock ticks on the seasonal pavement business, many companies are either scrambling to fit in last-minute projects or prematurely deciding to postpone work “to the spring”. But when has the clock expired on the season? Are we in the top of the 10th or the bottom of the 7th? The short answer: We have time! Here are five important factors to consider and gauge just how much time we have for your pavement projects. 1. Hot or Not. The success and longevity of pavement projects depends greatly on the con ditions of the site during work performance. Temperatures dictate the performance of asphalt on-site, both in transport from asphalt plants and during actual paving installation. 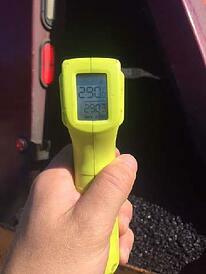 Asphalt should be between 275 and 325 degrees at installation. For repair projects, more flexibility in ambient temperatures is available as the installation will not have long stretches or “pulls” of asphalt. Overlays and new surface installations (sometimes called surface or top) should be performed in conditions of around or just under 50 degrees. 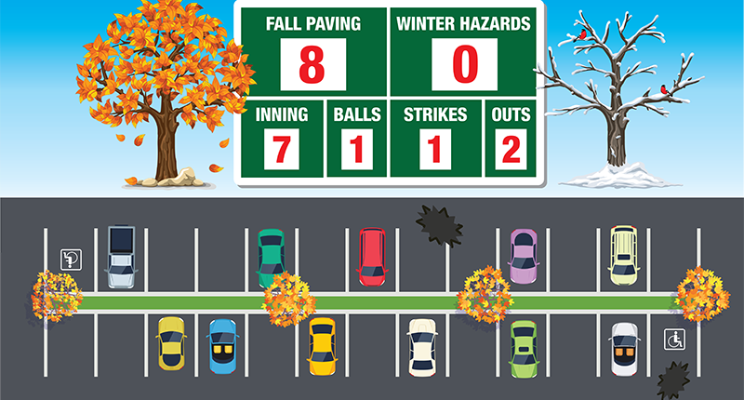 In New England, this usually means surface installation can be performed up to around Thanksgiving. 2. Runway for Success. Timing is everything. And proper planning prevents … you know the rest. As mentioned above, temperature drives the season’s end, but properly set up projects require a runway of time to ensure the day of delivery is not the day of disappointment. A team with ample resources to deploy, with a balance of complexity and capacity, will be ready to act as soon as the client gives the green light. A prudent “runway for success” is typically one to two weeks, though exceptions can be made effectively if needed. 3. Playoffs vs. Spring Training. In some cases, the project would be better executed in the spring. Scenarios involving extensive full-depth work or other scopes that would extend the overall timeline mean that the surface asphalt would be installed later in the season. These could be candidates for surface installation in the spring. But this doesn’t mean that the entire project needs to wait – full-depth repairs, associated concrete, site work or grading, and installation of binder course (sometimes called “base”, asphalt with larger stones that serve as the underlying foundation for the surface course) can be performed in the fall and into early winter without impacting the integrity of the finished product. Having the capacity to effectively push the project to success should be balanced with the practical, safe planning for the eventuality that seasons change on a dime. 4. Any Given Sunday. I know – it’s a different sport. But seriously: Every year is different. Some years the leaves are changing in late October then the snow flies by Halloween. Some years you’re wearing shorts opening presents in December. At the end of the day, preparing execution plans for full delivery should always be accompanied by a contingency plan if the weather changes abruptly. Having the capacity to effectively push the project to success should be balanced with the practical, safe planning for the eventuality that seasons change on a dime. That way, you’re both prepared and can act accordingly to the benefit of your customers, tenants, and colleagues. 5. Don’t Be A Turkey. The bottom-line is that we have time. There is over a month (at least) of pavement season remaining for project delivery. Even in retail environments with black-out dates, there’s still time! There is no need to panic but a healthy sense of urgency should be considered. Ask for options from your pavement partner and gauge their confidence in successful delivery without comprising quality and longevity of the finished product. 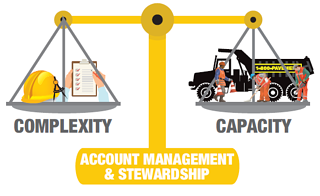 Communicating expectations, ensuring a sufficient timeline for project planning, understanding your level of flexibility with phases being performed in the spring, and being prepared with a solid plan if winter comes more quickly are the key factors that contribute to a success fall pavement project. As with every element of a successful project, the best pavement partners will have open dialogue about your project’s specifics and how best to approach your fall pavement needs!